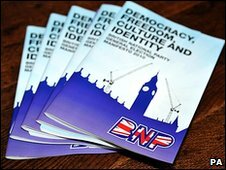 An end to immigration from Muslim nations and encouragement for some UK residents to return to "their lands of ethnic origin" are among the British National Party's proposals. However, leader Nick Griffin insisted at their manifesto launch in Stoke - where the party is hoping to gain its first seat - that immigration was just one aspect of the party's campaign. The 94-page document includes pledges to bring back British troops from Afghanistan immediately, leave the European Union and abolish quangos, including the regional development agencies. It also proposes to reallocate funds from the foreign aid budget to increase spending on frontline NHS services. The manifesto proposes that a new English parliament - alongside those in Scotland, Wales and Northern Ireland - would "oversee such functions of the present devolved administrations as cannot sensibly be accommodated by the [re-introduced] county councils". It does not make clear whether its policies would apply UK-wide or be devolved. Cut £18bn it says is spent on tackling global warming, which it describes as "unproved science"
Reintroduce right of householders to defend themselves and their property, "using whatever means they deem necessary"
Halt payment of benefits, and provision of housing, education and pensions to foreigners "who have not paid into the system"
Aim to increase state pension to £150 per week during the parliament, link to earnings and restrict to Britons and those who have "fully paid into the system"
Convene national conference of employers and workers' representatives to resolve public sector pension difficulties, raising the age of retirement to 68 over "a period of years"